Richard A. Simmons is a litigation partner at Waldron & Schneider and was admitted to practice law in May, 2000. Since starting his practice, Mr. Simmons has focused on civil litigation and trial, regularly taking lawsuits to trial. Mr. Simmons’ cases cover a broad spectrum of civil litigation including such areas as commercial litigation, bankruptcy litigation, construction and surety law, personal injury, wrongful death, breach of contract, and first party bad faith insurance claims. 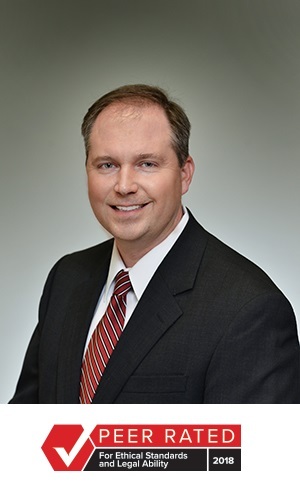 Since starting his practice, Mr. Simmons has directly resolved hundreds of cases through trial, summary judgment, arbitration and settlement, with more than 30 trials as first chair. He has worked on numerous complex business disputes, complex bankruptcies, multi-party construction cases, and defended several wrongful death and significant personal injury cases. Mr. Simmons assists in training younger associates in litigation skills and tactics, and he oversees a wide variety of litigation cases, managing associates’ activities on those cases. Mr. Simmons also routinely participates in speaking engagements for continuing legal education courses. Help us congratulate Richard Simmons, one of our litigation partners here at Waldron & Schneider, for his rating by LexisNexis Martindale-Hubbell of an AV Preeminent rating. This is the most esteemed and highest rating for any attorney, for ethical standing and legal ability. This AV Preeminent rating is the vertex of professional legal excellence. An attorney must be reviewed and then recommended by their bar or judicial peers in order to claim this trusted rating.